143 k, 141 k, 139 k, 141 k, 141 k, 141 k.
Visibly quicker than Warrier...looks faster than what speedguns are showing. that 122 k was probably 142K, that was an error. Baba Aparajith was trying to pull that but ball hit the bat before he could get into position to play the shot. This guy is ready for international cricket no ifs or buts, averaged 140 today and fastest about 144, n domestic guns read 4 to 5 k less usually. Accurate at the batsmen, good use of short ball, his pace is same when he hits short or gets it on difficult good length, very athletic, good action, strong action, to me he is the best bowler I have seen not playing for India, along with Nathu, Aniket. Nathu for test as he gets swing at good pace. If only selectors take of their myopic glasses and pick the thoroughbreds. Thampi, Aniket, Nathu Sangwan should be looked at also, Warrier, Siraj, Aaron, R Kiran should be inducted in A team n not poor bowlers past 28 years age like V Kumar, Aravind, Dinda. - who has been bowling better? - Aniket Chaudhary is the one in A-team now for India, right? many times you are reason i keep coming back to ICF during workday, your honest phast fan reporting over the years is honestly admired and respected by fellow phast bowler fans. may we soon see an Indian express pace battery in tests in near future. add @Cricketics good work with the gifs must have taken some effort. Agree 100% as a fellow fast bowling fan and cricket fan @express bowling bro is one of the top posters on ICF. Always looking forward to his posts. If you didn't watch a bowler's performance in a game best place to go to is "Speed and performance of fast bowlers" and have a look at his posts there. He owns that thread with his regular balanced posts. well he does have the most reputation lol. Really good poster indeed. The funny thing is he never posts outside Cricket Talk. Only here for phaast bowlers. Love reading his posts. @express bowling & RKT - These 2 are my GEMS . No disrepect to others pl.. Don't get me wrong. That's why bit surprised not to find Ankit's name in potential category by him. Express Ji , is there something i am missing why Ankit is excluded by you? Would like to hear from you. The more I look at this thread, the more I think: for one thing, he's a real cricket player. Unlike some other tearaway fast bowlers we've seen :-)!! Is India becoming the land of fast bowlers? Off late, we have been producing genuine pace bowlers at well and it will be unfair to compare us with Pakistan because we are ahead of them. I think even as of today, we have more 5-6 bowlers who bowl 145+ Not a lot of teams can boast of this. He has control, pace and temperament. His height and control will get him wkts and would prove to be economical as well. When i see Rajpoot he always gives me the impression even if batsman is going after him he wont loose the plot which umesh does. It must be said that if the Indian cricket fraternity had the kind of love for fast bowling as lots of good quality posters in ICF have.....we would have developed a fast bowling culture `15 years back. Unfortunately selectors didn't pick him in Iran trophy team as well as the 2 practice games against bang and aus. He is doing well in small trophy. Hoping he will get a chance in a team or against any visiting team soon. 2 A teams for one day practice matches against England, a ROI side and 2 A teams for 2 / 3 day matches. So....5 teams in all. And we have seen Vinay, Dinda, Kaul, Vignesh type trundlers. I have been saying this for a long time , we need a pace bowler part of the selection committee permanently.Thats the only way we will get the right bowlers rather than just picking on stats. Yes...either that or some top cricketer like Ganguly or Laxman who keep on talking about the need to have some genuine pace in the attack as a whole. Definitely, very interesting reads and gets you pumped for the future of fast bowling in india. Slowly we are seeing great changes! Only becoming the land of fast bowlers if it starts aggressively selecting them in all formats and rotating them. As much as i want that to happen, my only fear is they ll have someone like Venky or some trundler who will select similar trundlers. What to do with selectors, but atleast this selection commitee is making some good moves. Hopefully rajpoot's number comes soon. lol tics get your self a broad. Not the bowler. South Zone squad: R Vinay Kumar (capt), Vijay Shankar (vice-capt), Tanmay Agarwal, Mayank Agarwal, Vishnu Vinod, Ricky Bhui, Dinesh Karthik (wk), G Hanuma Vihari, Pavan Deshpande, Rahil Shah, M Ashwin, D Swaroop, CV Milind, Sandeep Warrier, Basil Thampi, S Arvind. CV Milind, Sandeep Warrier, Basil Thampi, S Arvind & Vinny as fast bowlers. I will be really pissed if Arvind is in the playing 11. Both Warrier and Thampi should be in the playing 11. Where is the third member of the super dooper pace trio. 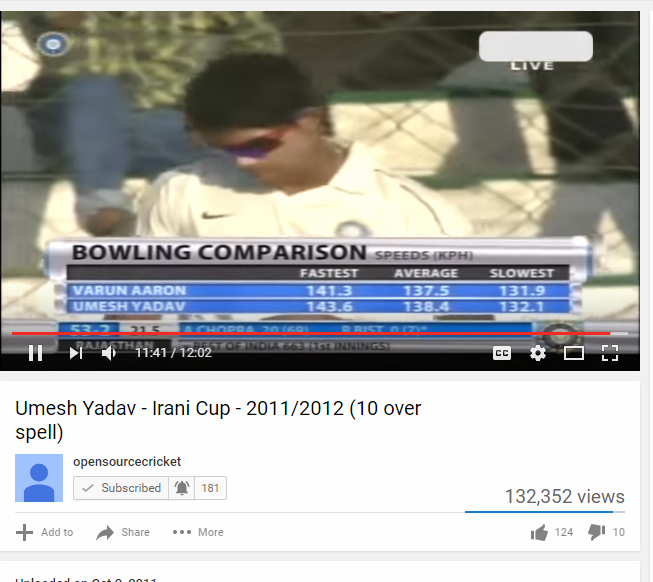 watch this video Irani trophy 2011-2012. Fastest delivery from Umesh is 143, Aaron 141. 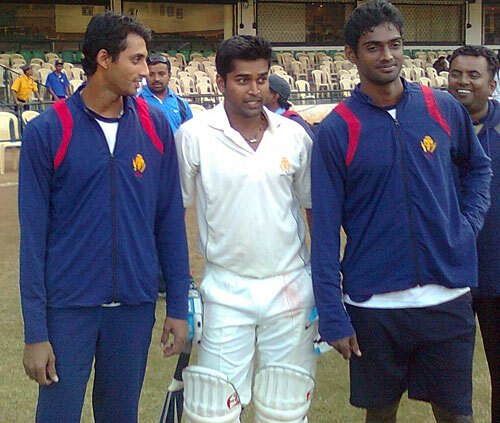 While when Umesh and Aaron played international cricket later in the year, they both clocked 147 and Yadav even clocked 152 on Australia tour. This proves what we have been saying for many years..... domestic speed guns show much slower pace....by around 5 k.
And Thampi and Nathu are all genuine fast bowlers and Shardul, Rajpoot, and Warrier are not far behind. This group needs special attention. Why was he in a hospital ? That is so awesome man. What was his reaction to this thread?